Weekend Kits Blog: Kid's Craft Kits - Knotting, Sewing & Weaving! Kid's Craft Kits - Knotting, Sewing & Weaving! Crafting is a great way to spend a creative family day at home, especially when the weather outside is keeping everyone indoors. Starting a new craft project is a nice break from electronic toys, computers, and television. Kid's will have fun crafting and creating! We have new product arrivals in the Kid's Craft Kits section of the store. Craft activity kits from ALEX include materials, tools, and easy instructions for kids. Getting started crafting has never been easier! 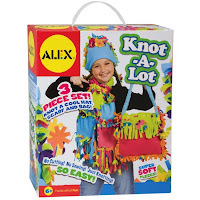 The Knot-A-Lot Kit is an easy fleece activity kit for kids to knot a scarf, hat, and bag. This fun knotting kit includes colorful fleece pieces, plenty of flowers & fringe, and a lacing tool. Step-by-step instructions for knotting each item are provided. There's no cutting or sewing required to complete the knot-a-lot projects. The fleece pieces are pre-cut, pre-fringed, and ready for knotting! The scarf is approx. 5 feet long and the bag is approx. 10 inches square. Recommended for children 6 years and above. 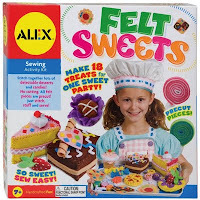 The Felt Sweets Sewing Activity Kit is a creative craft kit for kids to sew felt desserts, including decorated cakes, cookies, and candies. Kit includes felt shapes, pom poms, seed beads, embroidery floss, needles, doilies, and stuffing. A full-color instruction book shows each step of the sewing assembly process. The felt shapes are pre-cut and punched with holes for easy sewing construction. This is a great first sewing kit for kids to learn basic sewing and stuffing skills. Recommended for children 7 years and above. 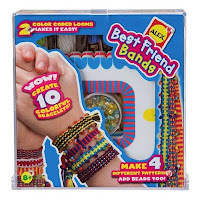 The Best Friends Bands Kit is a fun bracelet making kit for friends to do together. Kit includes 2 foam weaving looms, 10 colors of floss, seed beads, beading needle, and easy instructions. There's enough materials to make 10 bracelets with beads. The color coded looms make it easy for to create different bracelet patterns. Recommended for children 8 years and above. Craft kits are ideal for holiday gift giving. Visit the Kid's Craft Kits section to see our complete selection of creative craft kits for kids. I recently came across Kids Craft Weekly, a fun website full of ideas for crafting with young kids. Just click on the "i play at kids craft weekly" icon on the left and see what it's all about. Once there, you can sign up for Amber's crafty newsletter full of creative ideas, fun activities, and craft projects for kids. Learning new skills builds confidence! Kid's enjoy learning how to make things by hand and are proud to share their finished masterpieces. Explore a variety of craft kits for kids and adults at Weekend Kits and be ready for your next Weekend at Home! Crystal & Glass Pearl Jewelry Making Kits!